If project managers are only 1% of the team why don't we focus on training the other team members of our projects? We live in a world of flatter org design, every team member is a valuable part. CRITICAL: A Framework acts as the common platform from which all project related communications, governance and workflow is delivered - and easily aligns across all industries and all departments. Imagine if we all were on the same page. At a minimum, the PM Framework should be fully understood by every single role (management, front line, analysts, officers, accounting, financials, audit, safety, sales, marketing, legal, maintenance, etc). 90% of all students within Framework focused training, conferences, seminars, etc. should be attended by non-PM type roles. Reminder: they do not need the 5 day PMP training, but they do need the 4-8 hour Fundamentals that covers the ENTIRE framework and not just 1 or 2 knowledge areas. The beautiful thing is that a best practice framework already exists and is proven for decades, and is now getting the publicity it deserves. It is even going mainstream (outside the PM office and into the business and operations offices). That framework is from the Project Management Institute (www.pmi.org). It is critical to understand what a framework is, then you also can understand what Project Management Training is needed for the entire team. 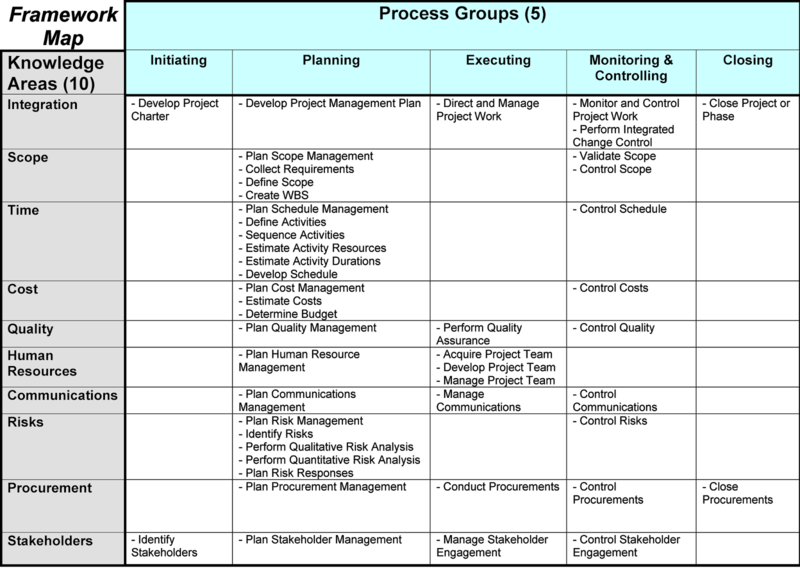 A framework covers all the main aspects of project management, starting with the phases or stages of a typical project. These phases/stages describe how you "flow" through a project. The simplest would be to say "start - middle - end". However, our framework says " Initiate - Plan - Execute - Monitor & Control - Close". These phases/stages help to understand how to move through a project lifecycle and be focused on different things during different stages. E.g. early stages we focus on questions of "Why, Who Leads, What High Level and How Aligned", then in late stages we focus on the details of "What and then How to deliver on the What". The second part of a framework are the iteratively occurring "knowledge areas" - always bouncing around in our heads, helping us focus in and out on a specific area of the project. Essentially, each knowledge areas can be considered a Section of your Master Project Plan (all the headings of a great Project Plan). Always remember that acronym, S-T-C Q-H-C R-I-P-S and be aware, if something changes on one area, then likely it has impacted almost all the other areas. Each one of these knowledge areas should have a well-documented subsidiary plan which can be pulled out of the master plan and discussed, and thus enables the "Entire TEAM" to help monitor, control and manage it. Save/Copy the picture image above, print it out, have it handy at all times, give copies to your team during your kick off meetings, spread the word to your entire organization. Identify custom training that can meet your needs and cover the framework for all team members (I can recommend many!!). We all will have a more structured approach, more consistent expectations and thus less stress and more success. Excellent post to share.. Web Designing Training Institute in Chennai | Web Designing Training Institute in Velachery. The aim of PM framework is to establish a common framework for the management of projects. They vary in detail from organisation to organisations but critical to the success is the freedom given to those projects managers and senior managers to adapt the stages to suit the size and complexity of the project. Good Post..Thanks for sharing this valuable information.. I am expecting more interesting topics from you. And this was nice content and definitely it will be useful for many people..Linux Training Institute in Chennai | Linux Training Institute in Velachery. nice article! thank you for sharing such a useful information about project managers. this is very helpful to me keep updating the block, hear i prefer some information about jobs for your career hr jobs in hyderabad . it is very easy to understand but we want extraordinary examples.....Thanks for updating.. I am so happy to read your blog, keep posting.. Impressive post. This pmtip pm training was very helpful. Keep updating and thanks for sharing. Such a great articles in my carrier, It's wonderful commands like easiest understand words of knowledge in information's.. Your Blog is really wonderful..I have read your article,its very useful to us..keep updating.. Very nice blog. I like the way you explained these things. I hope your future article will help me further. Nice blog..thank you for sharing..it was interesting and impressive....keep updating.. Wonderful post to updating..Thank you. I think really your post was superb...keep sharing your post..
Amazing Article, thank you for sharing this grate information. I am very glad to read your informative blog. hanks a lot very much for the high your blog post quality and results-oriented help. I won’t think twice to endorse to anybody who wants and needs support about this area. Your very own commitment to getting the message throughout came to be rather powerful and have consistently enabled employees just like me to arrive at their desired goals www.besanttechnologies.in/hadoop-training-in-bangalore. Excellent blog, really helpful to me. It is an excellent article. Thank you for sharing this with us.